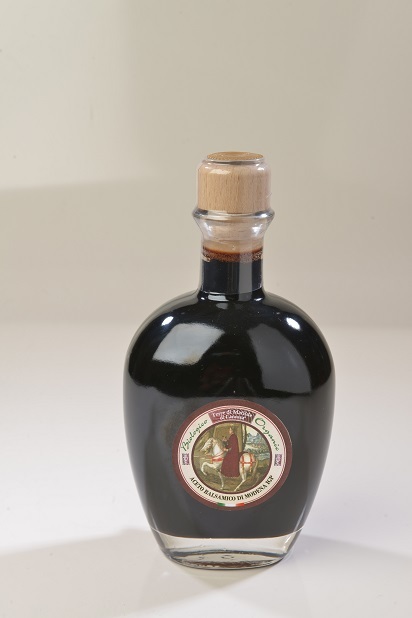 is the youngest Modena balsamic vinegar of the line. It is produced entirely from a selection of organically grown, grapes of Lambrusco and Ancellotta from ours vineyards located in Reggio Emilia and Modena province. Produced from a skilful blend of Cooked Must, further concentrated with the traditional method over an open fire. The wine vinegar contains no preservatives or food colouring. Refined in oak barrels, with decisive and bitter-taste ,it ideal for everyday use, with its intense fragrance, pungent flavour with a sweet, slightly astringent note. It is delicious on salads and cooked and raw vegetables. is a company that works with its own vineyards following the entire production process, from grapes the finished product in organic farming. The term "Organic Farming" is a method of cultivation and breeding which only admits the use of natural substances already present in nature. Does not allow the use of synthetic chemical substances (fertilizers, herbicides, insecticides). The Our vineyards are all grown organically from the beginning. From then to now all our efforts are directed to the preservation and the natural fertility of the soil. Today the method of organic agriculture is well known and precisely regulated in almost all the states of the world. we are specialized in the production and distribution of typical products of the Emilian ... Follow Our adventure, enjoy!